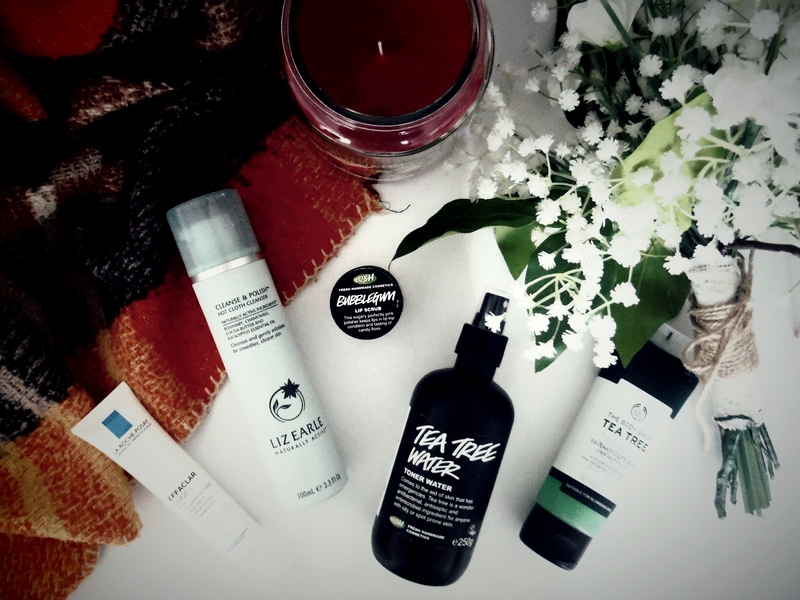 Now that the colder months are here it means I've had to change a few things in my skincare routine to make sure I'm giving my skin the things it needs. I'm also going to be starting a new course of Roaccutane this autumn so I need to make sure I'm not using products that will aggravate my skin. I thought it would be nice to share with you guys some of the products I'll be using this autumn! I recently came to the end of my Tea Tree cleanser and whilst I do love it, it is quite drying on the skin so I didn't think it best to repurchase. My skin is about to stripped bare of any oils from the Roaccutane so I decided to switch things up and go back to the Liz Earle Cleanse and Polish. I wouldn't say it's anything groundbreaking for problem skin, it doesn't make a huge difference to my breakouts but for sensitive skin or skin that just needs some gentle loving I think this product is perfect for. Even though I've switched up my cleanser, I couldn't bare to part with my Tea Tree scrub. This one is from The Body Shop and I love it. I'm onto my third tube and I know I won't be switching to anything else any time soon. Tea Tree is a great ingredient for treating spot prone skin and even though the scent is a little strong, I really adore using this product. Another product I won't be switching from any time soon is the Tea Tree Toner Water from Lush. I did a full post on this product a while back, which you can check out here, because it's just so good. Whilst it hasn't cleared my skin or stopped breakouts from appearing, I know I can rely on this product to dry up and shrink a breakout overnight. I would seriously recommend this to any of you suffering with breakouts. I'm currently using the La Roche Posay Effaclar Duo + and I love it. I started off using it in between my toner and moisturiser and didn't notice much difference, but when I switched to solely using this as my moisturiser it completely changed my skin! I'm still continuing with the dermatologist because no product will ever stop the spots from appearing, but this product works insanely well at getting rid of the breakouts. I apply this morning and night and I honestly can't tell you the difference it's made to my skin. A lot of people love this product and if you suffer with problem skin then definitely add this to your list of products to try. I'll definitely be carrying on using this for a long time! I like to use a lip scrub quite often now and my current favourite is the Lush Bubblegum Lip Scrub because it smells, and tastes, incredible! My current face mask of choice is the Soap and Glory Fab Pore Mask and Peel, which is probably one of the freshest face masks I've used and makes my skin feels very clean. I'll probably add some moisturising or brightening face masks to my skincare routine over autumn as well so if you have any recommendations let me know! What products are you currently using? La Roche-Posay is one of my favourite skincare brands along with Vichy. I love the La Roche-Posay Serozinc Spray it is amazing. The bubblegum lip scrub looks great!! The lip scrub looks so good, I am definitely going to have to try that because I get such dry lips in the winter! Great post and beautiful pictures you have here on your blog. I love the tea tree water from Lush but never tried the Tea Tree scrub. It sounds great, might have to pop into Body Shop next time I'm in town. Do you know of any cleansers that are actually good at stopping any little acne? Update from my comment on your acne post:... my skin is suddenly getting a lot better! I definitely still have a few tiny pimples, but I have no more full on spots anymore. I feel so much more confident now, I totally get what you mean about acne really getting you down, but just remember that's not all that matters. It'll go away eventually and from all the photos that I have seen of you, you look absolutely gorgeous!